via my cottage yard farm. This entry was posted in How to and tagged composting, how to build a compost fence by Julia. Bookmark the permalink. OK. I’ve never heard of a compost fence. Seems like the idea would not be to harvest the material – ever…. so what is the purpose? I have seen gardeners plant zucchini or cucumber plants in these structures. The vines grow out to cover the wire mesh. As more leaf/grass material is added, more soil is produced for the crops. It’s ingenious ! The woody material breaks down slowly over time, releasing a fine dust of composted material at the bottom of the fence that slowly leaches into the garden. Would there be a rotting odour? 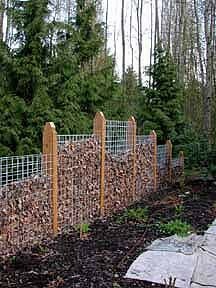 I have never heard of a compost fence…..seems like a lot of work with little rewards….I do see how beautiful it could look if it were planted with flowers or vegetables. Wire is not cheap. Why not just make a compost bed OR a fence? Hmmmm. Seems interesting idea. I could use it for the rear of the garden boxes. It could be double up as the deer barrier to keep the deer from sneaking up in rear. And I like someone’s comment about putting zucchini and cucumber on the inside side. Hmmmmm! I would be interested in hearing from the Boy Scouts Troup 348. How did the fence work. If it is working properly you should need to replenish the material. of course like your web-site but you need to test the spelling on several of your posts. Several of them are rife with spelling problems and I in finding it very troublesome to tell the truth on the other hand I will definitely come again again. I intended to post you that very small observation to be able to give thanks once again for all the pleasant techniques you’ve provided at this time. This has been remarkably open-handed of you to grant easily just what a number of us would have made available as an e book to make some money for themselves, most importantly now that you might well have tried it in the event you wanted. The strategies also worked to be the fantastic way to be certain that many people have similar desire similar to mine to realize a little more with reference to this issue. I think there are a lot more pleasant times in the future for those who scan through your website.